Hi, my name is peter. I am a patient, friendly and qualified class c manual and auto driving instructor that is dedicated in safety and observation training and aiming for first time passes. I have had over 10 years of training experience in bus and car operation, occupational health and safety in the work place and heavy vehicles and cars. I run a manual dual control car and I replace the car every 5 years, I can train in your car manual or auto. I emphasise safety and observation and am a expert in preparation for the licence test. 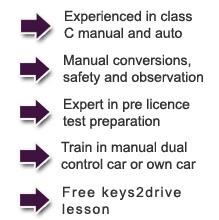 If you currently drive an automatic and would like to learn how to drive a manual car, I can train you. Certificate IV in assessment and workplace training. Certificate IV in driving instruction. "Great driving instructor, easy to get on with, made learning how to drive stress free"
"Cant get any better and that is no joke, best person to talk to and best person to learn from." "I passed, I didn't do anything wrong and they took me on the same testing track you took me on. I got a reverse park and a kerbside stop and I nailed them. Thank you so much peter for your good training and help."